You are at:Home»Articles»What You Have Been Told About The Book of Revelation? Look at the image above. The title “The Revelation of St, John The Divine” is inaccurate. In fact, it is untrue. The Apostle John was not given a revelation, Jesus Christ was. See that? This is a revelation of Jesus Christ that God gave him! It is amazing to me how what was given to Jesus, some else is given credit for it. What Jesus is – The Word of God – a book has been given that title. I believe most persons who claim to be followers of Christ are in a slumber and have allowed themselves to be misled and deceived with regards the One True God and His Son. They move forward as if they have heard everything on the subject. Yet, the fact of the matter is: They have only heard what is either popular, assumed to be true, or what they want to believe and accept. They exist within a small comfortable circle of understanding and afraid or dare not venture outside of that small sphere of understanding. That circle is for them a prison. Christianity’s mission is to ensure they remain inside that circle. That city yet to come in which Christ dwells will be his future one thousand year kingdom over the earth. Disciples of Christ would be looking for the city that is to come. Christ does not exist within any religious organization today. If he did exist, he would exist divided because he is taught differently and each denomination claims for itself that it is right and the other denominations are wrong. Yet, there is only one city that is to come in which Christ would dwell. We eagerly await it’s coming because we know our Master is there. It makes absolutely no sense for persons to herd themselves into the man-made, self-named so-called Christian religious organizations who say Christ is within them. They deceive themselves and deceive others into believing it. The reason why I can make such bold statements about The Book of Revelation is that all of the books and stories I have read about it, all have one common thread running through them that makes them all inaccurate explanations of that book. I will reveal to you that common thread in a moment. Please continue reading. This article will only whet your whistle; stimulate the more than 100 billion neurotransmitters in your brain. This article will not cover all aspects of the Revelation. I am currently half-way into a book I am writing on the subject. It will provide a verse-by-verse explanation of the book. No one … and I mean no one is writing about what will be presented in my book. What I will do in this article is explain to you why everything you have read or heard about The Book of Revelation is wrong. The Revelation of Jesus Christ that God Gave him – in my opinion – is the most important document in the world today. It is more important than a book men made up a name for – The Bible. Yes, the revelation is in The Bible but who told the framers of the Bible to put it there? The revelation has an author and a title. I strongly believe that it should be detached from this book called the Bible and made to stand alone and apart from it. Revelation 1:1 says that it is “The Revelation From Jesus Christ Which God Gave Him To Show His Servants What Must Soon Take Place”. There is your title. I have already shown you who the author is. Another reason why this is the most important read we have in our possession is that no other work is prefaced in this way. No other work is a “revelation from Jesus that God Gave him.” This is the revelation and we should pay very close attention to what it says. We are told that it came from God and He Gave it to His Son to show his (Christs) slaves the things that must shortly take place. God did not give to any religious organization, man, woman or Prophets of old (who are dead anyway). He gave it to His Son. So the revelation message is for ALL of mankind born since Adam. Why? Because Christ died for ALL of mankind. Why Are ALL Books and Explanations About The Revelation In Error? Pay close attention because it is here that I reveal to you the common thread I mentioned. The Most High God gave His Son the revealing or revelation why? “To show his (Jesus’) servants what MUST SOON take place.” Now I want you to think: The imprisoned Apostle John when he received the revelation from the angel that Jesus gave it to, to present to John to write down died almost 2000 years ago. So the statement, “To show his servants the things that must soon take place” could not apply to our time period today as two thousand years have passed since John wrote the revelation down. Notice that Jesus said that his servants will be hated by all nations because of him (his teaching). Keyword: ALL OF THE NATIONS. Before some of you say Hilter was not a Christian, let me say to you, are you? It is not what YOU say he was or was not, it is what he believed himself to be just as YOU believe yourselves to be one. Yet, the United States, Great Britain, France, and Russia – ALL Christian nations – fought against another Christian nation, Germany, in a deadly war. So within our time period, so-called Christians hate each other. Note: Russians profess Christianity more than any country in Europe and was always a Christian nation in practice. It had leaders who were atheist and that is as far as it went. The Russian people in the past and to this day profess Christianity. 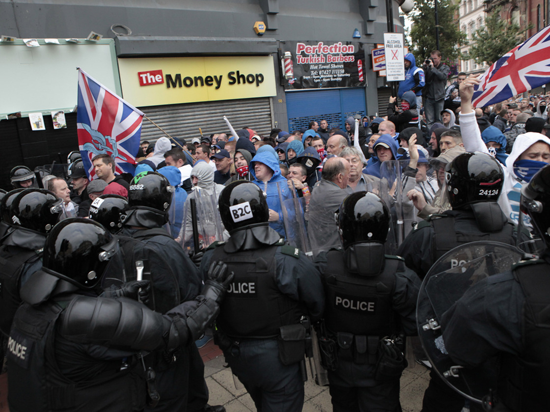 While not dominating the news today because of the “terrorist” fixation someone wants everyone to have, the violent, hateful and deadly clashes between the two main Christian groups the Catholics and Protestants in Belfast, Northern Ireland has been going on since the 1600s. The most recent violent clash occurred today (August 10, 2013). The August 10, 2013, confrontation between Catholics and Protestants (shown in the photo below), injured 57 people. Christians In Violent Confrontation With Each Other and Law Breakers. Nothing Lamb-like Here! There are much more examples of Christians hating each other. But this is all presented to show that what Jesus said in Matthew 24:9 concerning his followers being hated by ALL nations because of him has not arrived yet. Christians are not united and are engaged in the acts of making war on others and hating each other. This also shows that what the Apostle John wrote down at Revelation 1:1 could not apply to our time period today. In order for Christ servants to be hated by ALL of the nations, a time period must exist in which all of the nations are united, not divided. The nations of mankind would have to be united under one government, and that government would demand allegiance to itself and any not supporting it would be viewed as enemies of the State. Revelation 13:16-17 speaks of a time when persons will be forced to support a Beast (which will be a future world government). Those not supporting (worshiping) this government will not fare very well within it. So the only way Matthew 24:9 and Revelation 1:1 would make sense is if the entire world was united, in agreement that it will not tolerate Christs followers (servants) and the work they do and be in agreement in hating them. That world is yet future and we are not even close to its approaching. It is far off as you will see in a moment. The expression at Revelation 1:1 “To show his servants the things that must soon take place” makes sense only when ALL the world is united under one government and one belief system. That world has not arrived yet. Now I will tell you why all of the books and beliefs about the Book of Revelation are in error: Because they all apply events of our time period as having fulfillment in the Book of Revelation. Nothing In The Book of Revelation Has Had a Start of Being Fulfilled? Why would I say such a thing? Because when The Most High God said at Revelation 1:1 “To show his (Jesus’) servants the things that must soon take place” he was giving a warning of what would and must happen shortly (soon) after Christ’s future 1000 year kingdom ends. This makes sense. Why? Because Christ’s future 1000 year kingdom is established on top of the existing world governments that his kingdom destroys. In other words, there will be no United States of America, United Kingdom, Germany, France, China, Russia, Japan, etc. They will all be gone when Christ’s future 1000 year kingdom over the earth (from heaven) begins. ALL will hear his voice and come out of their graves. He did not say, some. He did not say just those who believe in him. He said ALL. Besides many who lived thousands of years before him or who lived even when he lived but who lived in different parts of the world, would never have known him. So this great resurrection is a wonderful and marvelous future event. It will be one of Christ’s official and loving acts as king. But before that resurrection, he must accomplish one important thing … He must abyss (not destroy) Satan for the exact same duration as his kingdom. Satan will be locked up and unable to interfere with Christs 1000 year administration over the earth. It should be understood that Christ’s future 1000 year government over the earth is a definite one. In other words, it has a beginning and ending. It will come and it will end. Blessed and holy are those who share in the first resurrection. The second death has no power over them, but they will be priests of God and of Christ and will reign with him for a thousand years. When the thousand years are over, Satan will be released from his prison. The purpose of Christs 1000 year kingdom over the earth is to restore all of mankind back to God as Adam was in the beginning. Did Adam have or need a Savior? No! Adam talked to God one-to-one without a go-between. Today we speak to God by praying to Him THROUGH Christ. There was no need for Adam to pray EVER to God as Adam could speak to Him directly. By the time Christ’s kingdom has ended, no one from mankind’s beginning will be in graves and will have been resurrected and restored to God. All of mankind will have been SERVANTS OF CHRIST, their king of 1000 years. After his kingdom ends, Christ is no longer king over mankind. His mission accomplished: The restoration of mankind back to his Creator. What exists on the earth in those future days after Christ’s kingdom ends, is a righteous human society all united under their Creator. They ALL know who their God is and KNOW his requirements for continued life as Adam did. Why would they know these things? Because Christ would have taught them over that 1000 years under his rule over them. At that time man stands one-to-one before his Creator. No intermediary. No go-between. No Savior needed. Able to communicate with his Creator as Adam did without the need to pray to Him through a savior. What happens next explains Revelation 1:1 and identifies the time period of the contents of the Book of Revelation. What Happens After Christ’s Kingdom of 1000 Year Government Ends? When Satan is released, he goes out to that world that it took Christ 1000 years to restore back to God, to deceive them and prepare them to battle against something. What? The nations Satan goes out to deceive are not the nations we know of today. These future nations are people of the various racial (tribes) and language groups who all lived through Christs 1000 year rule and were united to their Creator by him. Revelation 1:1 is a warning to Christ’s servants of what will soon take place AFTER his 1000 kingdom ends. SATAN IS RELEASED and he will out to them to deceive them and trick them to fight against something righteous and true. That means that the contents of The Book of Revelation catalogs the events that will occur shortly after Christ’s kingdom ends. Nothing in that book has had a START of being fulfilled. The beast as not ascended yet; there is no image of the beast yet; no 666 yet; no war in heaven betweeen Satan and his angels and Michael and his angels; Satan has not been cast down out of heaven yet; no Babylon the Great yet, etc. Satan knows that the coming down of God’s Kingdom to the earth will be his destruction. After Christ’s Kingdom ends (not the same as God’s Kingdom), Satan will ascend and bring up with him a Beast. This Beast will be another throne or government over the one Christ left behind. Yet, Satan will not change much of what Christ established on the earth. In fact, Satan’s Beast (Throne) will be a “peaceful and safe” one. It too will be a paradise. Those living in it will not initially know that anything has changed. Satan deals in subtleties and needs his seemingly hidden government to be attractive to those he will deceive. Think: When he deceived the woman Eve, was it is a paradise? Yes, it was! Satan’s deception and preparation of that future world will leave it loving the world they live in. The only ones who do not fare well are the few who stayed awake and listened to their Master when he warned of something occurring after his kingdom ends. It will not be apparent to the world when Christs kingdom will have ended and Satan let loose upon that future world. However, subtle changes will be noticed by the few and they will know that Satan is upon them and they will not support the changes occurring. It takes a measure of time to establish governments and we do not know who long it will take Satan to establish his beast, image, and false prophet (harbinger of propaganda) and use them to deceive that future world and prepare their mindset to resist and oppose the establishment of what Satan knows will come to the earth: God’s kingdom. At Matthew 24:3 What Was Jesus’ Disciples REALLY Asking Him? The beginning of something: His coming or 1000 Kingdom! The ending of something: The end of his age or 1000 year Kingdom! They asked for a sign (a single event) and not signs. So all of the talks about wars and rumors of wars, nation rising against nation, kingdom against kingdom, earthquakes, food shortages ARE NOT what Jesus was referring to. These are multiple EVENTS and not a SINGLE event. Jesus mentioned a SIGN. Jesus gives them that single event at Matthew 24:30. Christ comes as a king with power and great glory. Remember, his disciples asked what would be the SIGN of your COMING and Jesus answers: With power and glory. That is a king, people! The event of his coronation as king of 1000 years is unseen by anyone on earth. Only the angels in heaven – along with Satan – will witness that event. The only thing mankind will see is his coming on clouds. In other words, mankind will mourn in gladness as it will hear the voice of the invisible one (in clouds) as he calls them out from their graves at his coming as King. This King will identify himself t those he resurrects. They will know who it was who performed that miraculous act upon them. They will KNOW (they will see or perceive) this great king as doing it. He comes with power; the power to resurrect the dead. When on earth, the power to resurrect the dead was done by God’s power and permission. Jesus was not a king. His coming will be different. It will not be by God’s power that he will resurrect anyone, but by his own power as King! The contents of The Book of Revelation has nothing to do with our time period today. It has nothing to do with the European Economic Community, The United Nations, The Religious Systems, etc. There is no Beast, no Image of the Beast, no False Prophet, no Scarlet Colored Beast, no 144000, and not 666. None of these things have arrived yet. THIS PROPHECY. NOT ANY OTHER. Take to heart what is written in IT. There is so much to explain about the entire Book of Revelation and I fully intend to challenge the existing status quo. That includes The Watch Tower Bible and Tract Society; the splinter group is known as The International Bible Students Association; Seventh Day Adventists and ALL of the ENTIRE system of religion called by men, Christianity with regard this subject. Religious organizations want you to become THEIR disciples and adopt the name or title of their organization. Yet, no other name has been given (by God) by which we are saved (for eternalifefe) None, other than Christ. Therefore, if religious organizations do not have the power to save, why should one join them? They are suppose to cling to and join Christ. The book I am writing and professionally publish, will definitely set a virtual fire in the world of Christianity. It will agitate and make many angry. However, it will cause one never to read the Book of Revelation the same. I cover everything. I expect to complete the book by the summer of 2014.